Cycling Liaison Group – An Emasculated Quietway? Richmond is going to get dockless hire bikes, but won’t get the full planned quietway. 14 separate roads are being lined up for contraflow cycling, North Sheen station will get a cycling channel on its bridge, the A316 quietway-or-superhighway-or-something-else isn’t going to happen any time soon, Twickenham Stadium will clean up their act on cycling signage on match and event days, and an improved design for Cross Deep junction to make it safer for cycling has been sent to TfL. The council seems to be running this a bit like a procurement exercise, even though they’re not planning to part with any cash. This has been in analysis for months, and we heard some slightly surprising things about what the council is worried about: bikes not being very nice, how good the apps are, and so on. There are reasonable questions too: how do we try to keep pavements clear? How do we ensure bikes are picked up if left in places where no-one wants them? The good news is that Councillor Buckwell, the Cabinet Member for Transport, undertook that at least one company would be in trials by April – keep those eyes peeled! The quietway plans managed once again to dominate the meeting with, in our opinion, appalling manners shown to the councillors and officers. The route was ridden by Will Norman, the walking and cycling commissioner, late last year, and he has refused funding for the Teddington High Street portion – according to the meeting this was essentially because he felt it was not good enough to be a quietway. However, the council has persuaded TfL to go ahead with the other two parts of the route: from Richmond Park’s Ham gate to Ferry Road, and from …. to Bushy Park. While we would like to see a complete route, and we think Teddington High Street should be an important section, the scheme has basically foundered on NIMBY local opposition. You may think we’re harsh to say ‘NIMBYs’ with such a broad brush, but it’s quite clear that neither the Teddington Society nor many of its members are overly interested in having people cycling along their High Street if that means they can’t drive or park. This is a shame, as it’s directly in contradiction to the Mayor’s stated goals around healthy streets, liveable neighbourhoods, and air quality improvements. A total of 14 streets are in safety assessment for contraflow cycling. We hope they’ll come to consultation in March or April. Each of these will only be a small project, but we believe that building a proper network for safe cycling across the borough is going to need dozens of small schemes like this, all of which eventually link together. This has been mooted for far too long, and we don’t have good news on it. There’s no schedule for when things are likely to happen, and we know already it’s been downgraded from a potential super highway to a quietway. We do know proposals are still being developed, so will be keeping our eyes open. For a long time, the council has been producing consultations where they seem to have either forgotten cycling, or stuck it in as a band aid afterwards – East Twickenham, Star and Garter [Richard Reynolds], and now East Twickenham. As many of you will know, Twickenham and Richmond get very busy on match and event days. To deal with these, there are road closures, crowd barriers, and various other changes. For some months we’ve been trying to persuade the RFU that they need to be better at managing traffic on event days – that they shouldn’t be using ‘cyclists dismount’ signs, that there are other barriers and layouts they should consider, and that they should be more actively supporting and thinking about cycling as a way to deal with some of the transport issues on event days. Thanks to persistence by local members, the council is meeting the RFU, and has promised to share a proper traffic plan before the next event. These allow you to get your bike across footbridges without having to physically lift them. We first asked for these under the previous cycling champion, the utterly useless Katherine Harborne. With the help of the cycling officer, these are finally being fitted to more and more bridges, and the next one will be the footbridge over Manor Road, at North Sheen station. We’re told that part of the towpath along the Thames around Petersham is going to be upgraded. While this isn’t going to be the full improvements we’ve been asking to this for a number of years (details here) it’s a small step in the right direction. Remember, things only happen when we ask, so we need your help to do so. 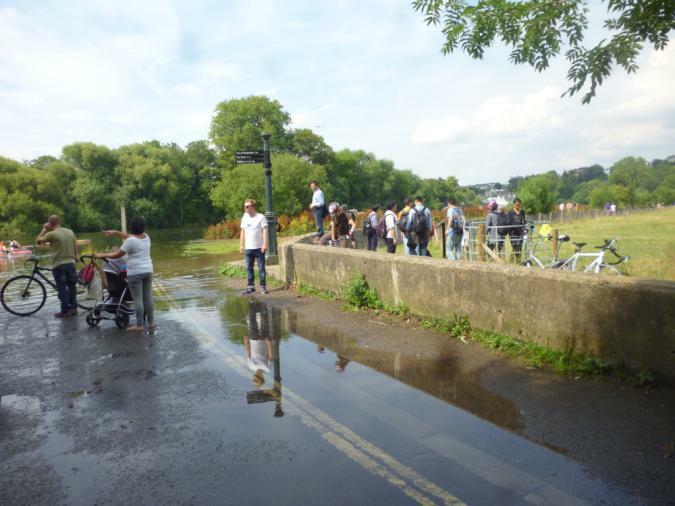 Please can we have cycling channels up the side of Richmond Lock steps? It’s hard work lifting bike up both sides.